Place 3 cups lettuce in the bottom of a large bowl and sprinkle with salt, pepper & sugar. 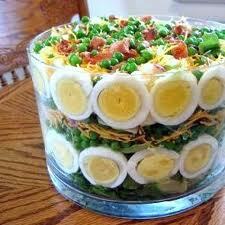 Layer sliced eggs on top of lettuce and sprinkle with more salt. Layer in order: peas, remaining lettuce, bacon and cheese. Spread Miracle Whip over top. Cover and chill 24 hours. Garnish with green onion & paprika. This is especially pretty if made in a large crystal bowl, but can also be done in a 9×13 glass baking dish. Make sure to cover the entire top of the salad and seal it to the edges with the dressing as it seals the lettuce mixture and keeps it crisp.